The Ocalla Tramway: Full Steam Ahead!! Alright, so I've discussed a little bit of background behind the Ocalla Tramway and a bit about its track plan. Sow what now? Well you can't run a model railroad without a few locomotives and some rolling stock, can we? So this post will be about the railroad's motive power and some to the equipment it will haul. As stated in my first post, most of the motive power is inspired by the little engines of the Arizona Copper Company. One other copper company, that shared a 20" gauge interchange with the ACC, was the Detroit Copper Co. Sadly I haven't seen many photos of the DCC engines, though they were all 0-4-0T types, where as the ACC's motive power, aside from their #1, all started off as 0-4-4 types. Considering the very tight radii of the track plan, 0-4-4 types would have a little difficulty navigating the sharp curves and steep grades up to the mine. So I've decided to stick with 0-4-0T type motive power, and MAYBE I might through in an 0-4-2T just for fun. Still debating on that though. 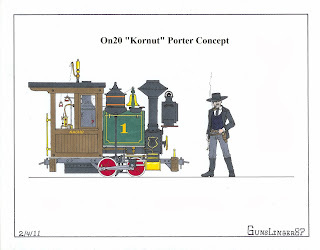 However most of my motive power will consist of small 0-4-0 Porter built locomotives inspired by the "Kornut" Porter, the smallest locomotive built by the H.K. Porter Co. Although I have yet to find any official drawings for the engine and I've never seen a photo of said locomotive (if one even exists) but I have read a written description of its proportions; and using that I came up with a concept drawing of the locomotive. The drawing is not to scale and it's somewhat proportional, but here is the general idea of what I'm going for. I added "Lee Van Cleef" there to give an idea of scale. I do have a scale drawing I did in 1/4" scale and I'll gladly post them... as soon as I can find a working scanner. I have an idea on how to build this as a model, and there is an HOn30 locomotive on the market that matches the wheelbase perfectly! Big City Hobbies' HOn30 0-4-0T steam loco! Now I'm sure some of you are thinking "Why not just go with On18? It's already N gauge!". The reasons why I'm sticking with On20 is, well 1: it has historical continuity to Arizona, and 2: it is a modeling challenge and it brings me back to where our hobby first started. Before all this pre-manufactured, mass produced, ready to run stuff hit the market. Where one actually had to do some work to make their models. And thirdly: It's unique and fairly obscure as a gauge to model. Anyway... when these HOn30 models are measured out in O scale they have a wheelbase of 3ft. And their drive wheels are roughly 18 inches in diameter. Just about spot on for the Kornut Porter! However in my design I made a few creative liberties just to make it easier to model the locomotive. The boiler was originally 20" in diameter and I upped that to 2'. That's about the extent of the changes I made, but I'll go more into detail when the time comes. 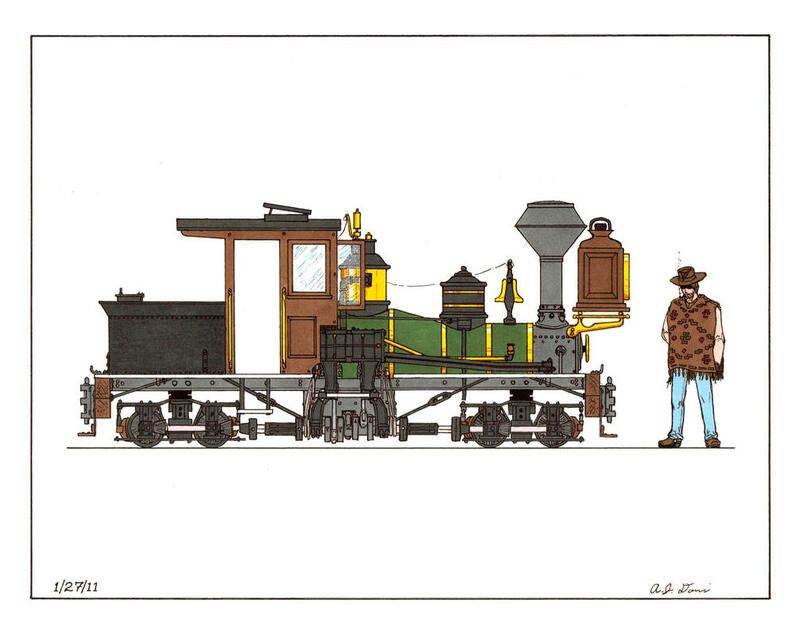 Another locomotive I have in the works is also an 0-4-0T type, but it's much larger and it's an outside frame design. The locomotive is a cross between the Detroit Copper Co.'s outside frame Porters and the Arizona Copper Co.'s #9 and 10 locomotives. Though the aesthetics lean more towards the ACC engines. Other parts such as the domes, fill hatch, headlight, and a few other things will be used on the model also. I had started construction of the locomotive but had to put things on hold for a bit. The kit I bought didn't come with any gears or motor, so I need to find a gear set that will fit for either an HOn3 gauge or N gauge locomotive. As well as a small compact motor, but one that still has some power to it. The boiler will be replaced with plastic tubing, shrinking down the boiler diameter to a scale 3ft. I'm still debating on whether I want to use the supplied saddle tank or order a pair of the smaller ones used on the Grandt Line 8 Ton Porters and splice them together. My primary concern is width, I've set a standard maximum width of 6' even and no more. This is based on drawings of ACC #s 9 and 10 as shown in the Logging Mining & Industrial Annual from March of 2004. Absolutely FANTASTIC article about the Arizona 20" gauge for those interested! Another one of my favorite types of locomotives are geared steam locomotives. Granted that, historically, there were no 20" gauge geared steamers in AZ (or as near as I can tell) I still wanted to have one... maybe two just for the heck of it! 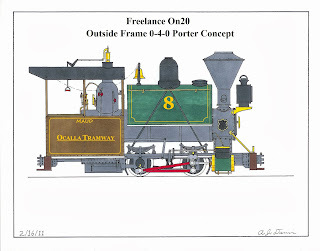 This idea was inspired by W.C. Green's On20 Gila Tramway layout. 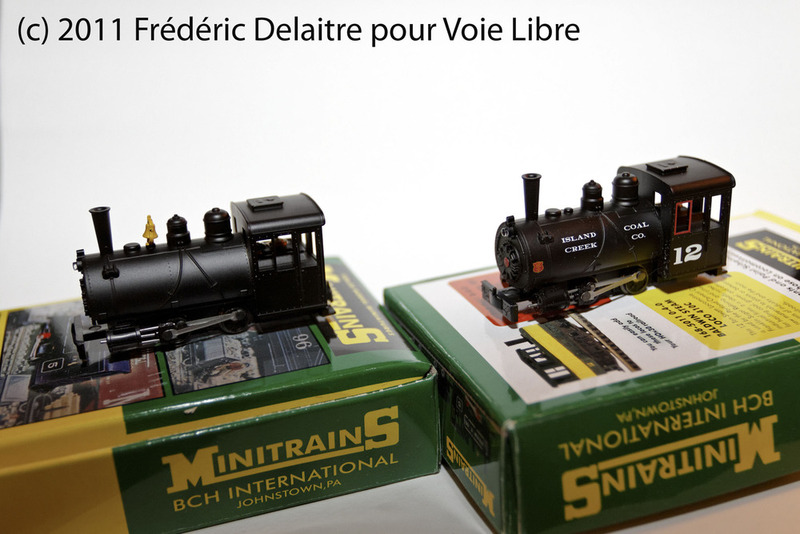 You can check out the evolution of this small layout on Freerails, here check it out! The Gila Tram's shay locomotives are all build using the old MDC HOn3 2-Truck Shay kits. The cab and some other details are built up to better match O scale proportions. 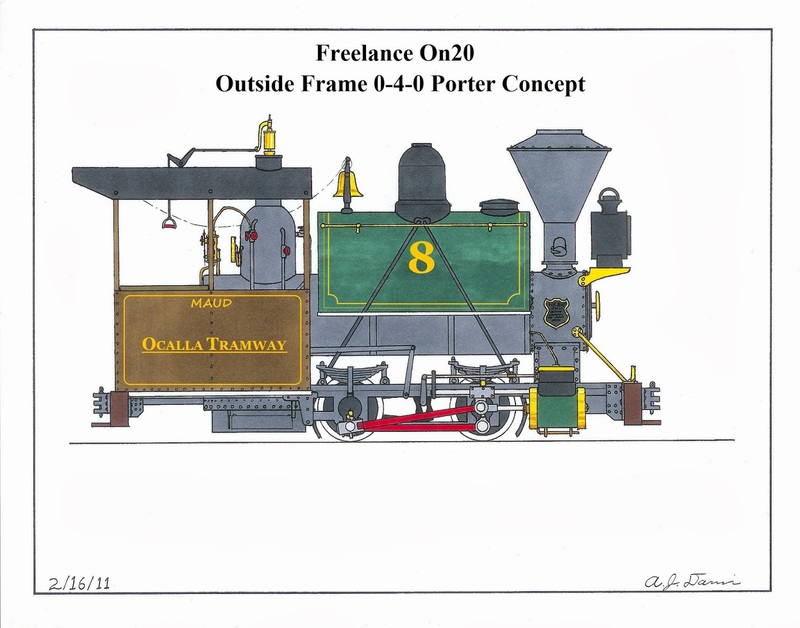 I have a concept for an On20 shay, though it would be a 2 cylinder rather than 3 and it would have an older style wagon top boiler. Here is a general idea for what I propose to build for a shay type locomotive. Wiseman Model Services offers a few Sn3 conversion kits for the MDC shay, each representing a different variation. Some with three cylinders and others with 2. Some with strait boilers, wagon top, boot leg, and even a T boiler version! Although the kits are S scale, their proportion would allow them to fit in perfectly with On20! The proposed idea here is to use the S scale wagon top boiler kit, but scratch build a new cab and add S scale fluted domes and other details. The headlamp may remain O scale to give it that odd, but attractive scale proportion. I am playing with the idea of building a second shay for the Ocalla Tramway, though one with a T boiler. Simply because I love the archaic look of the design and I feel it would look right at home in the wilds of the Arizona desert. Other motive power would be a 2 axle vertical boiler locomotive made from a Grandt Line HOn3 box cab mechanism, just to get something up and running for the tramway, or On20 in general. Well that's about it for motive power, I hope I've kept your interest. Next time I'll go over rolling stock and equipment. Stay tuned!